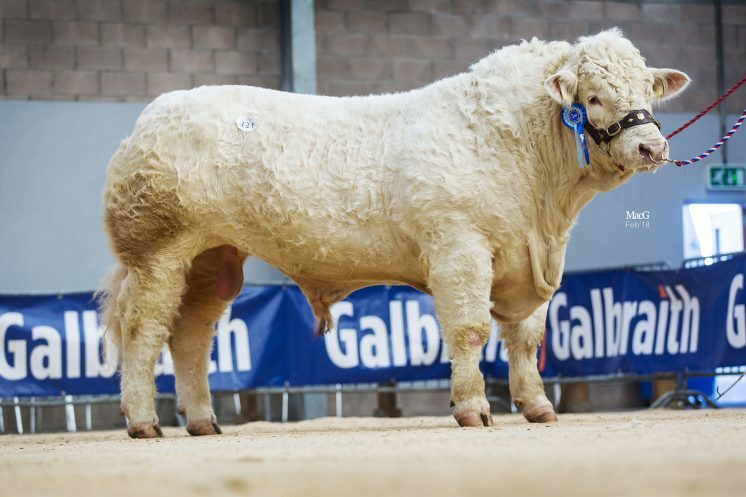 Charolais took the top price, made the highest average and sold the most bulls of all the breeds at this year’s spring sales, when commercial buyers drove the flying trade at Stirling on Tuesday 20 February. Bidding peaked at 46,000gns, 22 lots traded at five figure sums and 115 bulls sold to an average of £7,635 a whopping £1,514 increase on last year. Clearance rates were also up on the year by 6% to 88% for four more sold. United Auctions cattle Auctioneer Murray Raine backed up the Chairman’s comments by saying “It was a pleasure to sell the Charolais today, the vibrant trade is a reflection of the demand for Charolais sired store cattle in the market presently and that’s why we have seen commercial buyers here today willing to pay up to 16,000gns for their choice of bull”. 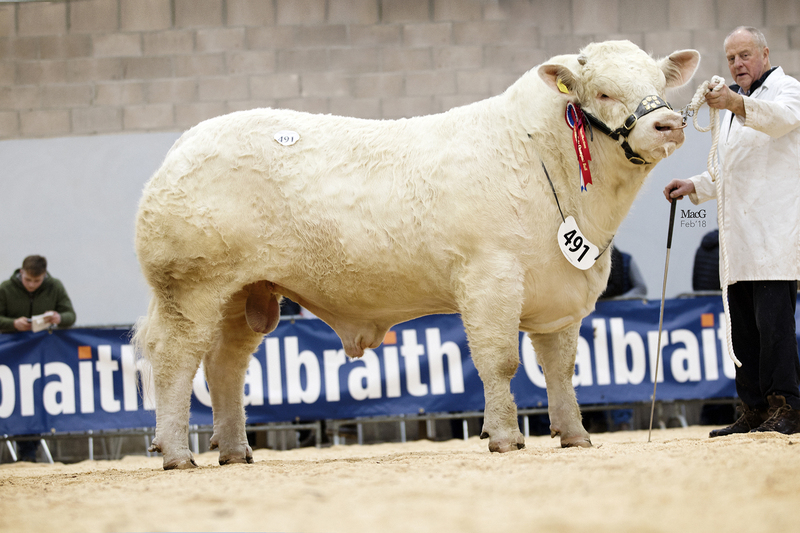 Star attraction at the sale was David and Nick Walter’s supreme and senior champion Balthayock Minstrel. Sired by the Kirrimuir Show champion Balthayock Ferdinand and out of Barbican Lancer daughter Balthayock Gem, the May 2016-born Minstrel attracted a 46,000gns bid from Bill Bruce, Meigle, Perthshire, who shared the purchase with Neil Barclay, Insch, Aberdeenshire. 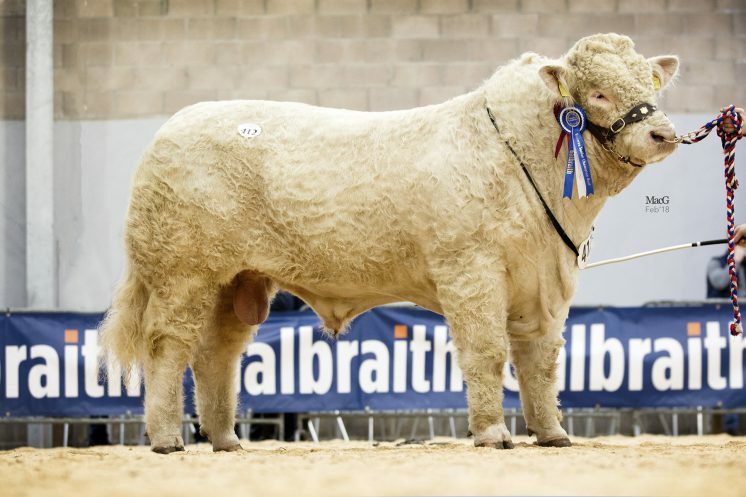 Breeder Major Walter is a stalwart of the breed who purchased his first Charolais bull 5,700gns at the very first public auction of Charolais cattle at the Royal showground in 1969. 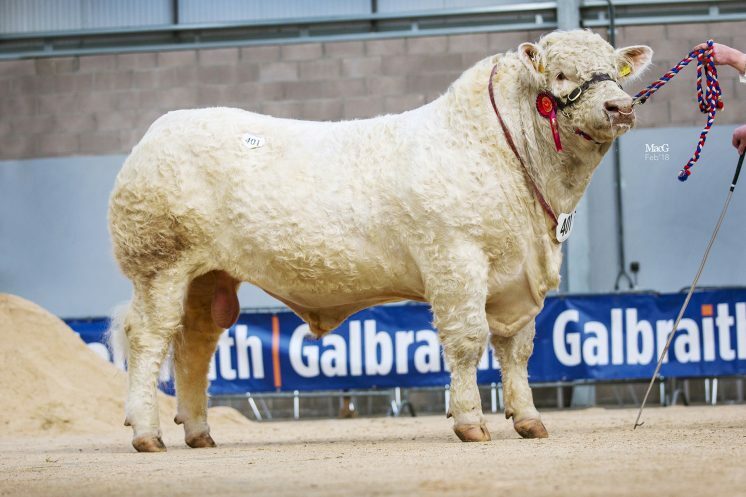 The pedigree herd now has over 110 breeding females with an additional 150 sucklers mainly served by homebred Charolais bulls whose progeny are sold as yearlings at Stirling. 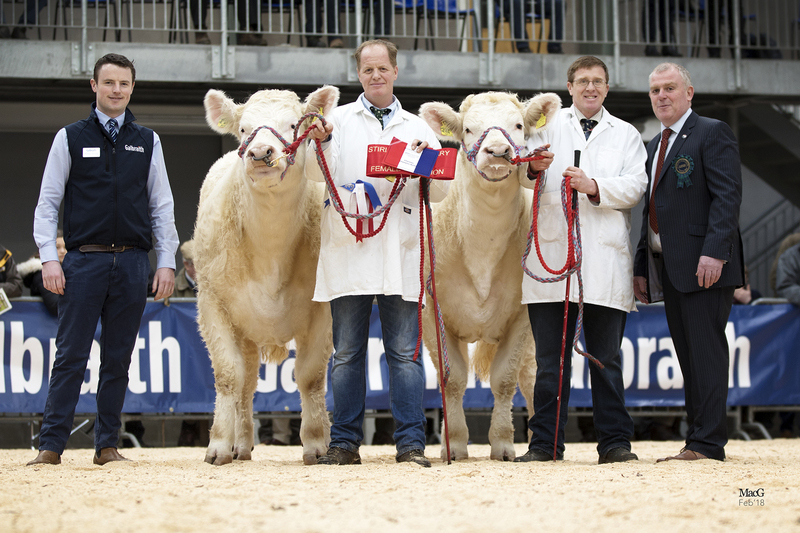 “I am delighted with the trade we have experienced today, not only for myself but for the breed as a whole. Since the introduction of the ABRI recording system we have been able to achieve a considerable improvement to the herd and place particular emphasis on calving ease and live weight gains while improving eye muscle area and scrotal circumference in our bulls and milk yield in our females.” Major Walter said. 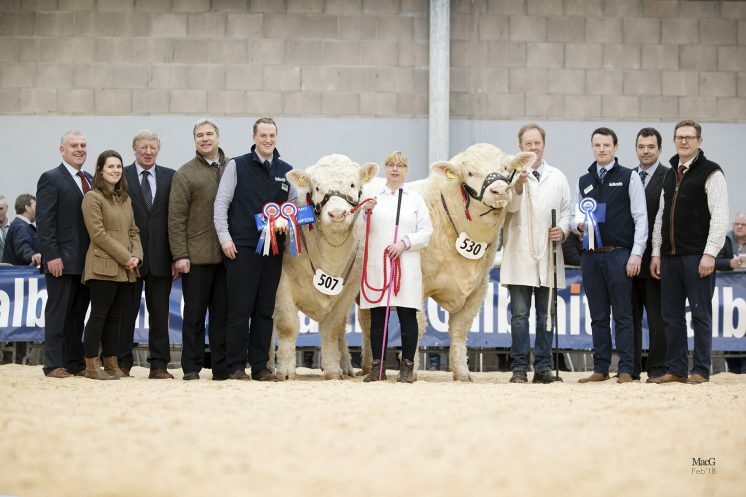 “As a pedigree breeder you have highs and lows and the sale was certainly one of those highs made possible by the wonderful team we have here at Balthayock”. 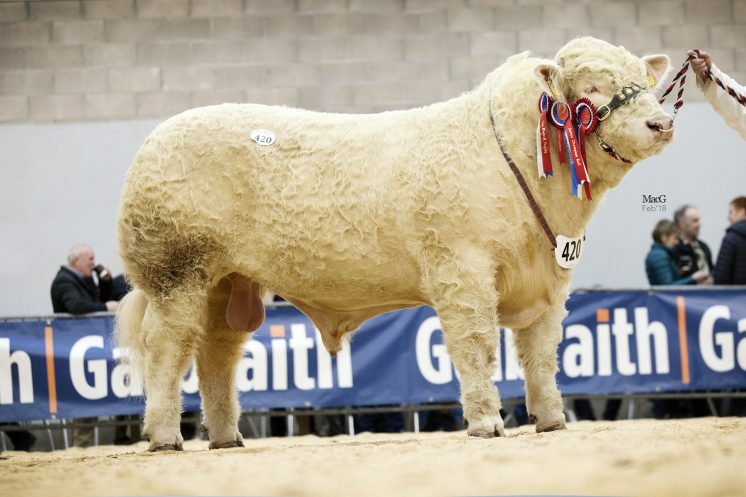 Judge Arwel Owen commented that, “Minstrel oozed presence and Charolais character from the moment I set eyes on him and that is why I chose him for my Champion. His functional correctness was amazing for such a powerful bull, he is a true out and out breeders bull. Subsequently following the judging and looking at the catalogue, it gave me great pleasure to see a bull with such fantastic data followed by a fantastic cow family that’s already delivered in 2017 show season with the highland show reserve female champion”. 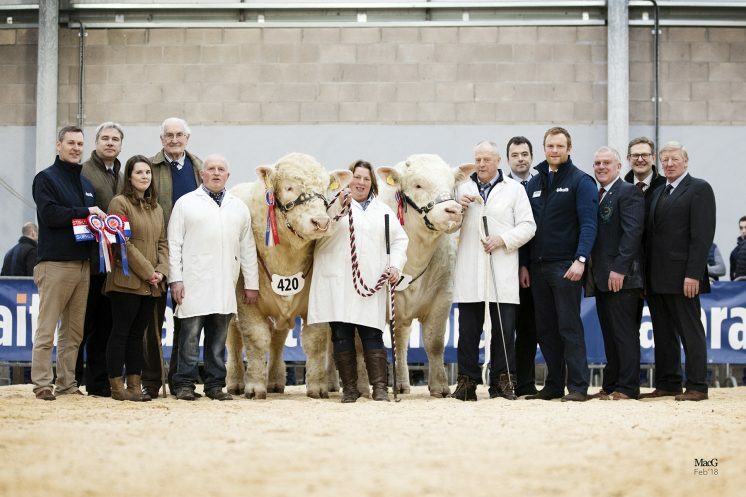 A total of nine Balthayock bulls changed hands to average £15,633 and Arwel went on to say “There were three outstanding stock bulls forward from the Balthayock herd. The other two being Balthayock Manifesto who I placed second in his class to the champion and Balthayock Mandate, the reserve senior champion. Balthayock Manifesto was also in the money for Major Walter at 19,000gns, purchased by Peter and Sheelagh Donger, Towcester, Northamptonshire. 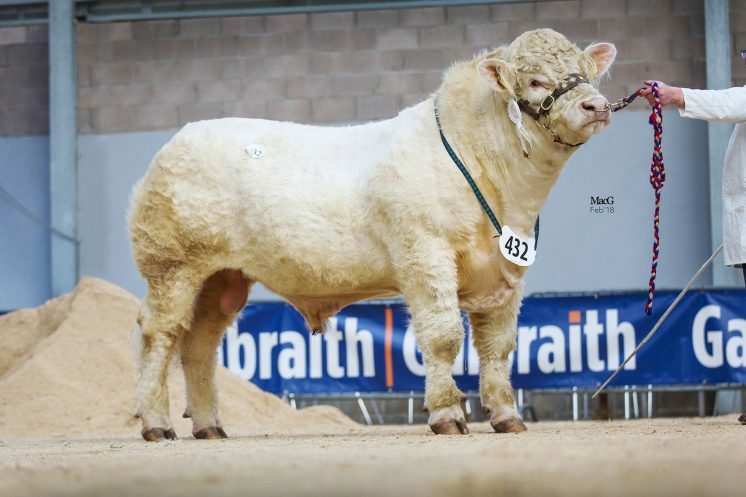 Bred from Swalesmoor Cracker daughter Balthayock Finesse, the May 2016-born Manfesto is sired by the Highland Show supreme M and S interbreed champion Balthayock Imp. Next in the trade stakes for the Major at 16,000gns, was the reserve senior champion Balthayock Mandate, a 21-month-old son of the 20,000gns Royal Welsh Show supreme champion Maerdy Grenadier and out of Balthayock Gold who goes back to Swalesmoor Cracker. He goes home to work with HR and C Dalrymplre, Ballantrae, Ayrshire. Adding to the Walter’s celebrations, they also received 14,000gns for another Balthayock Imp son. Class winner Balthayock Mikado who was purchased by James Jeffrey, Kelso, Roxburghshire is an April 2016-born out of Balthayock Heaven, a Swalesmoor Cracker daughter. 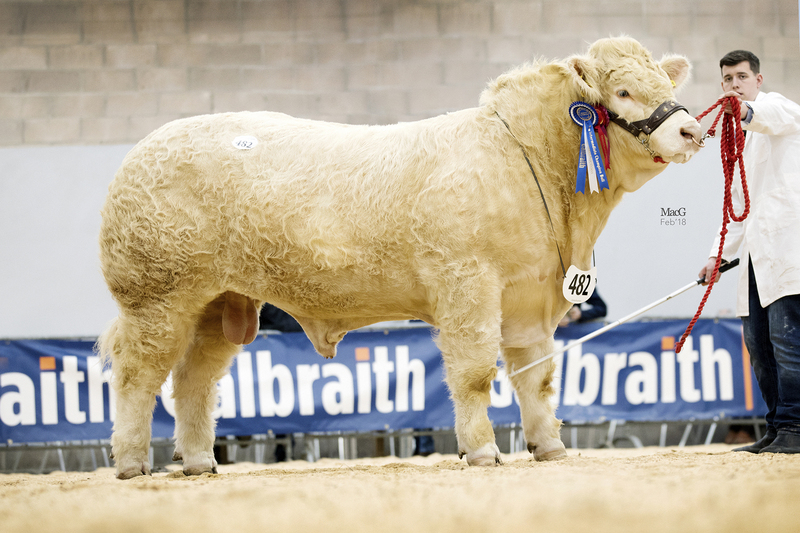 D Taylor of South Ronaldsay, Orkney purchased the Major’s final five figured bull at 10,000gns. The 20-month-old Balthayock Morgan, is a son of the Braco Show champion Ugie Echo and home-bred Barbican Lancer-sired Balthayock Ira. The aforementioned Neil Barclay’s Harestone herd was another to enjoy a great trade and sold eight bulls to level at £9,975. The first, a 22-month-old class winner, selling at 18,000gns was purchased by French breeder Gaec Godet Retailleau, of Sevremont. 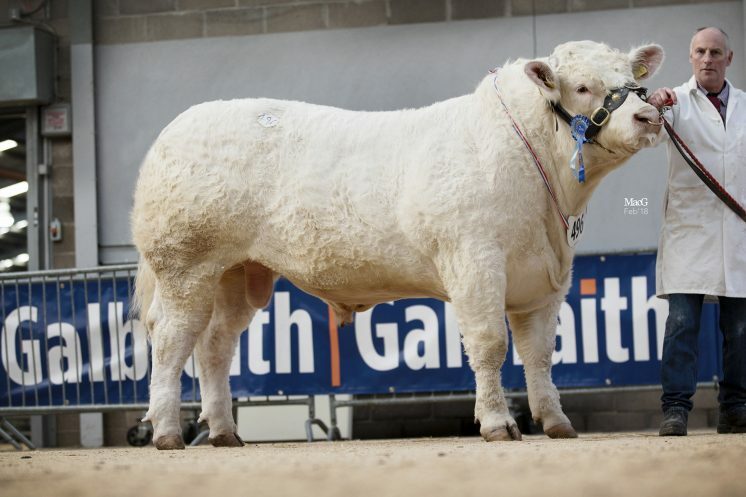 Harestone Monarch is the by the Royal Show junior champion Thrunton Socrates, while the dam is Shropshire-bred Trefonnen Ffion, a cow by the 14,000gns Allanfauld Superscot. Another class winner from Mr Barclay went on to sell 13,000gns. The June 2016-born Harestone Master Is sired by the 18,000gns Thrunton Fairfax and out of Blelack Gemma, a 15,000gns Goldies Dynamite daughter. P Cooper and Son, Kincaldrum, Angus were the purchasers. Mr Barclay went on to sell another high-priced bull, this time making 12,000gns for his yellow-ticket-winner Harestone MacGregor. L Forester and Son, Hexham, Northumberland, were the buyers of this 17-month-old son of the 25,000gns Stirling intermediate champion Inverlochy Ferdie and Harestone Tyrol-sired Harestone Francine. The 19-month-old Thrunton Montego from JHC Campbell and Son, Alnwick, Northumberland, was the next five-figure bull to sell. He boasts an impressive pedigree being sired by the 26,000gns Maerdy Hearthrob and out of Thrunton Goldcrest who goes back to the 26,000gns Stirling senior champion Balmyle Dickler. 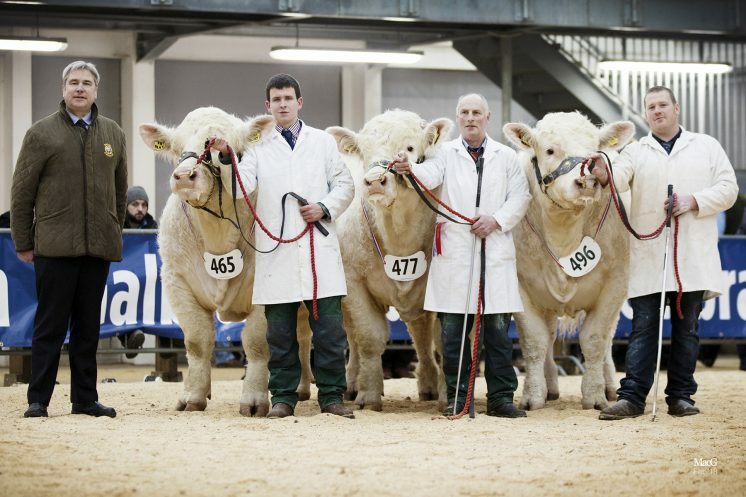 The man behind his 16,000gns final bid was CA Smith, Tarland, Aberdeenshire. 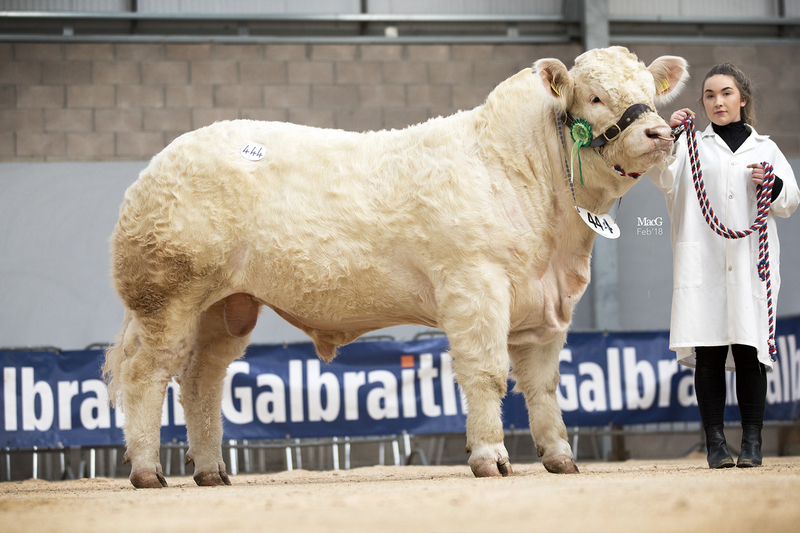 Just behind at 15,000gns was another Maerdy Hearthrob son, this time offered for sale by RM Adam and Son, Glamis, Angus. 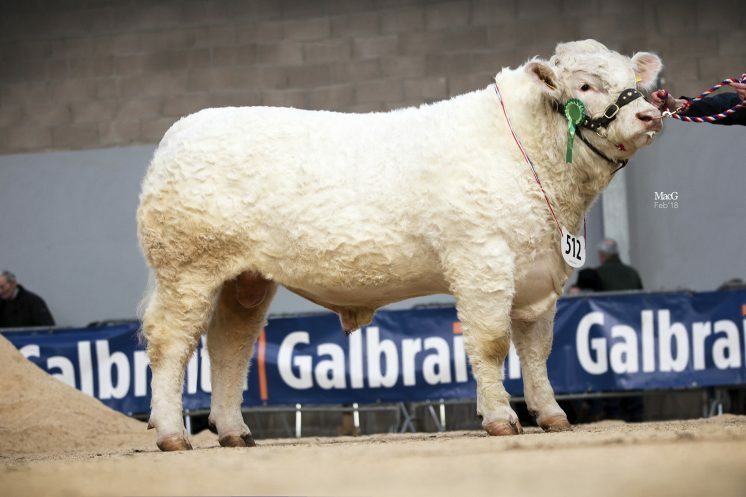 Newhouse Maxamus who had been tapped out as reserve intermediate champion twenty-four hours earlier, is a July 2016-born son of Newhouse Geisha, a daughter of the 28,000gns Perth supreme champion Brampton Nacodar and goes home to work in Co Down for the Ballynahinch-based Connolly family. 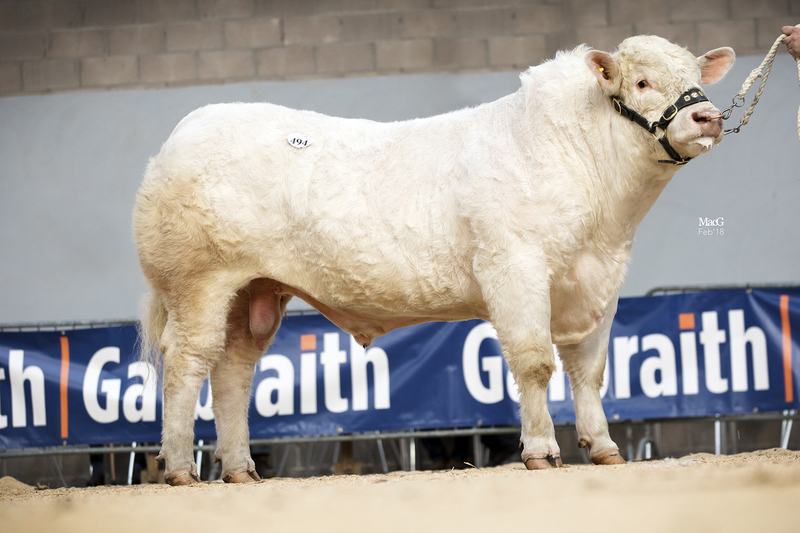 The reserve supreme champion and August 2016-born Maerdy Montypython, was the first of four top priced lots to sell for Flintshire Vet Esmor Evans, who sold a total of eight for an average of £8,990. Jeremy Price liked the look of this one and paid 14,000gns to take him home to Staunton-on-Wye, Herefordshire. 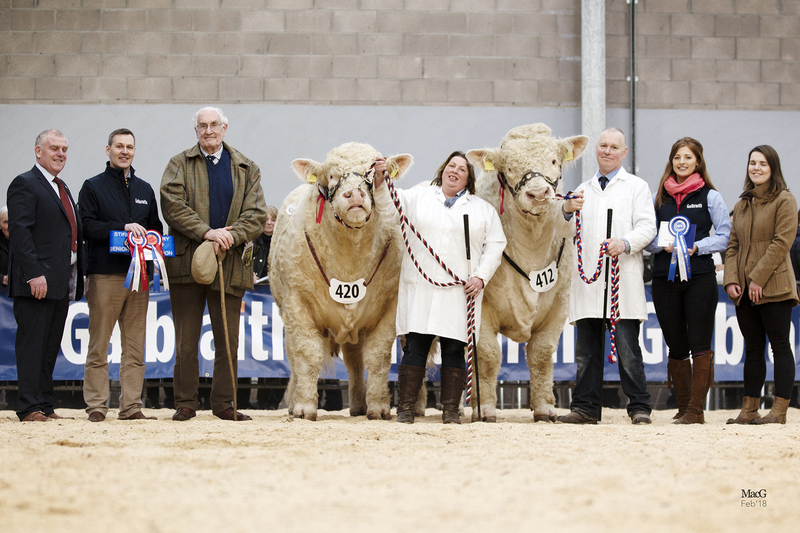 His sire, the 10,000gns Blelack Fabulous was also a reserve senior champion at Stirling, while his dam is the Begonia-sired Maerdy Goddess. Esmor’s next highest priced and selling in a two-way split to a couple of breeders from across the water at 12,000gns, was the 16-month-old Maerdy Maesmor. Maesmor is sired by the French-bred Maerdy Gouverneur and out of Maerdy Dynamite daughter Maerdy Iod. Jonathan Crawford, Maghera, Co Derry and Will Short, Omagh, Co Tyrone were the partners who purchased him. 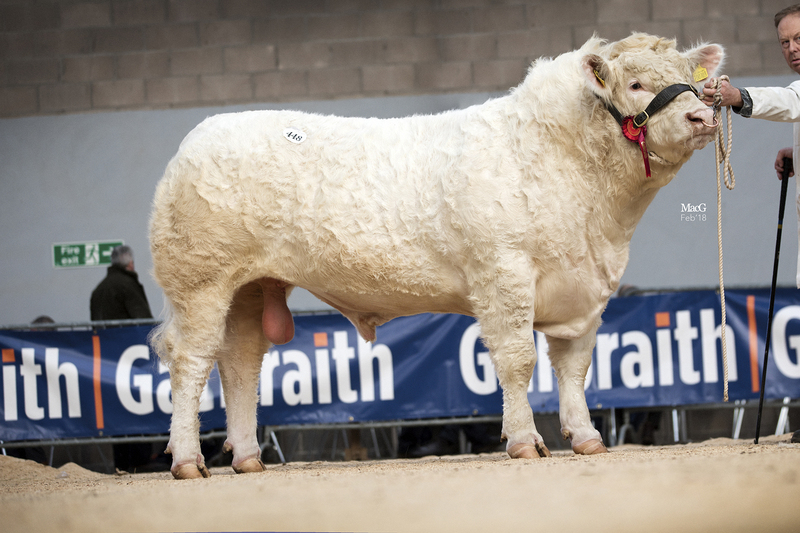 Also in the money for Mr Evans was the red-ticket winner Maerdy Maosglas, who sold in an 11,000gns deal to B Keir and Son, Alford, Aberdeenshire. 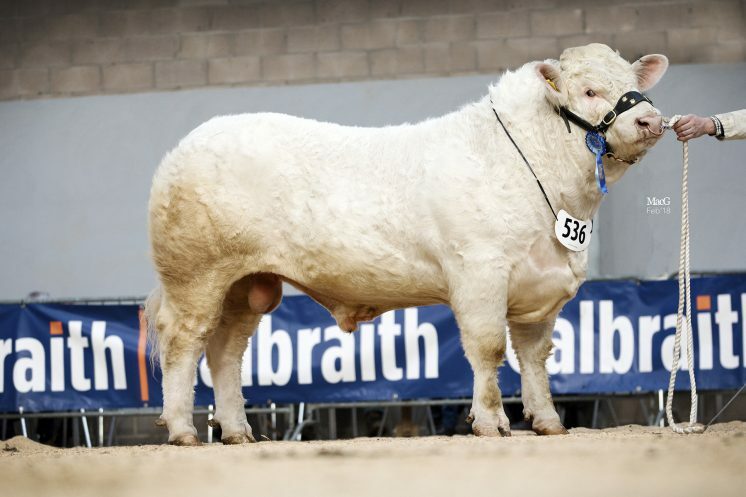 The August 2016-born Maoglas is out of the 16,000gns Stirling junior champion and Caithness Show supreme champion Clyth Diplomat daughter Maerdy Grug and sired by the above-mentioned herd sire Blelack Fabulous, who has bred sons to 28,000gns. Adding to Esmor’s celebrations, he also received 10,000gns for the October 2016-born Maerdy Maldwyn, who stood second in his class at the pre-sale show. Another Blelack Fabulous son, this time out of the Maerdy Blackout-sired Maerdy Daphne, he was purchased by H Stewart, Lybster, Caithness. 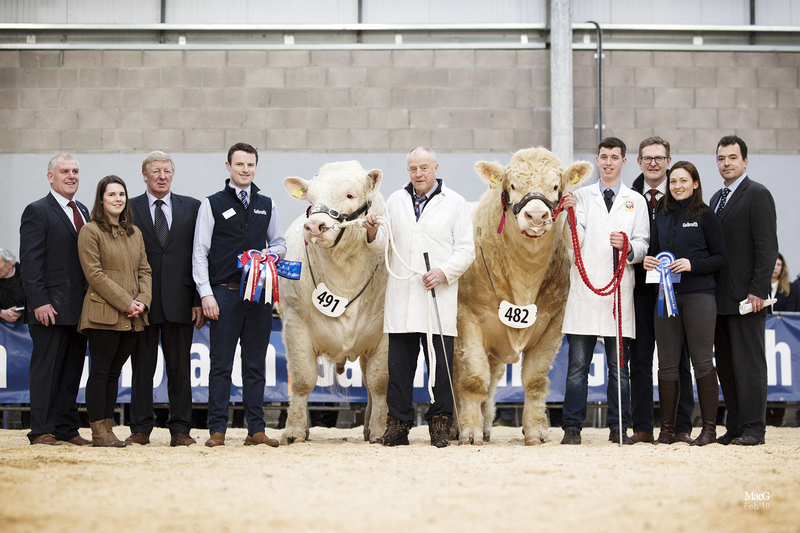 Two bulls were knocked down at 12,000gns a piece with the first coming from RS McAskie, Keith, Banffshire. 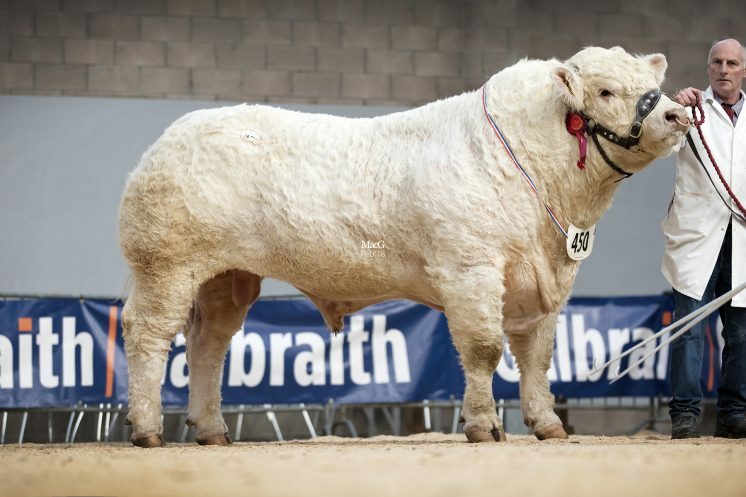 Staying local when purchased by WR Simmers and Sons, also from Keith, Strathisla Major is an 18-month-old son of the 11,000gns Carlisle senior champion Southwillow Hal and 19,000gns Doune and Dunblane champion Corrie Alan daughter Strathisla Hope. 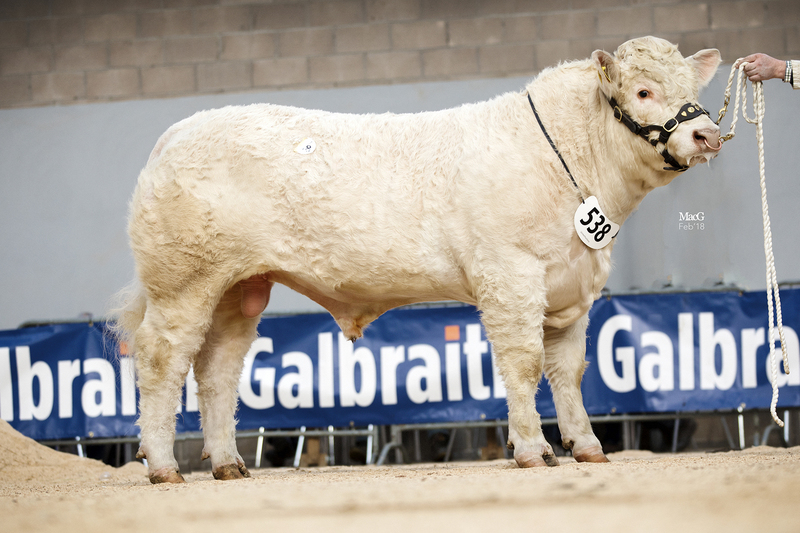 The second 12,000gns bid came from A Strachan, Brechin, Angus for the August 2016-born Falleninch Mars. The 18-month-old Mars, who was crowned senior breed champion and reserve interbreed champion at Stars of the Future in November for breeder and exhibited Andrew Hornall, Stirling, Stirlingshire, is out of a previous Stars of the Future show interbreed champion Falleninch Isabella and sired by Fairway Jefferson. Following on at 11,500gns was the June 2016-born Ballinlare Midas from J Wilson and Sons, Newry, Co Down, who stood third in his class on Monday. 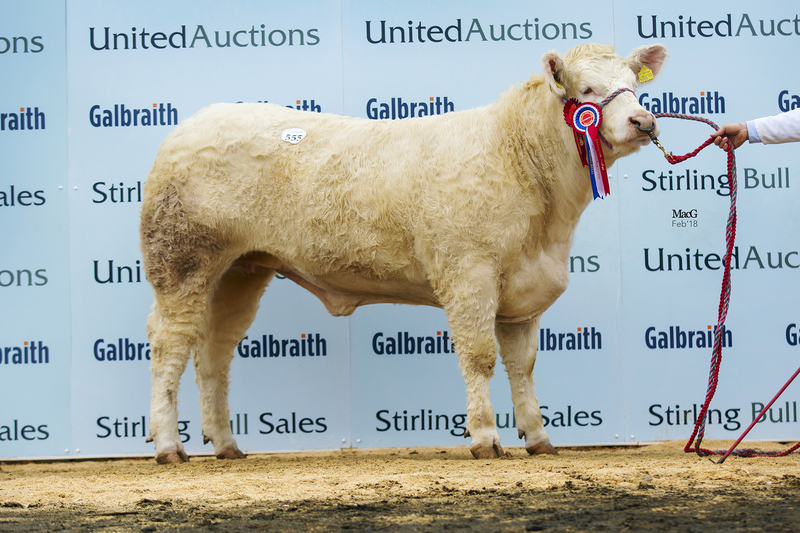 T Howden and Son, Balerno, Mid Lothian, were the winning bidders of this 11,000gns Burradon Goodfellow and 55,000gns Balmoral Show interbreed champion Sportsmans Columbo-sired Ballinlare Harmony son. Matching the 11,000gns price tag and also receiving a blue ticket in the pre-sale show, was an offering from WK and P Drysdale, Blairgowrie, Perthshire. Glenericht Mecca, a 17-month-old son of the Highland Show and Royal Show interbreed champion Fleets Vibrant and 12,000gns Caylers Gladiator daughter Glenericht Jen was purchased by D Muirhead, Arbroath, Aberdeenshire. 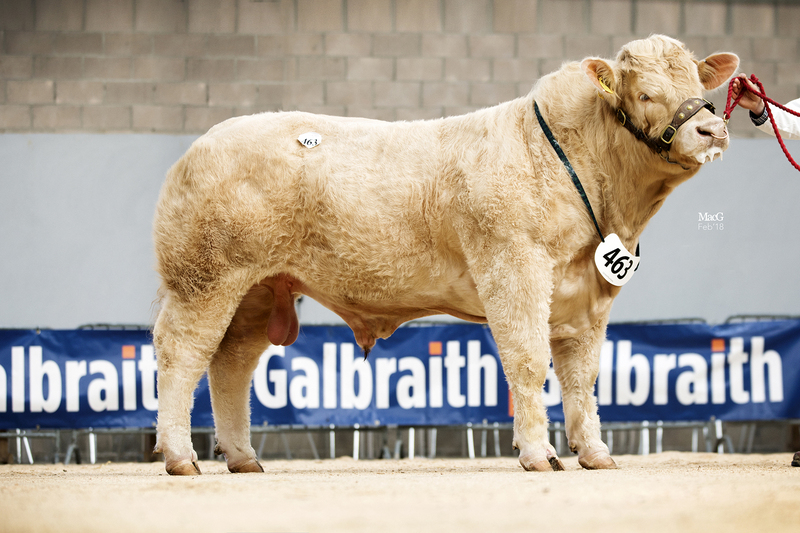 Four further bulls were knocked down at 10,000gns a piece, with the first coming from Hamish Goldie, Ruthwell, Dumfriesshire. 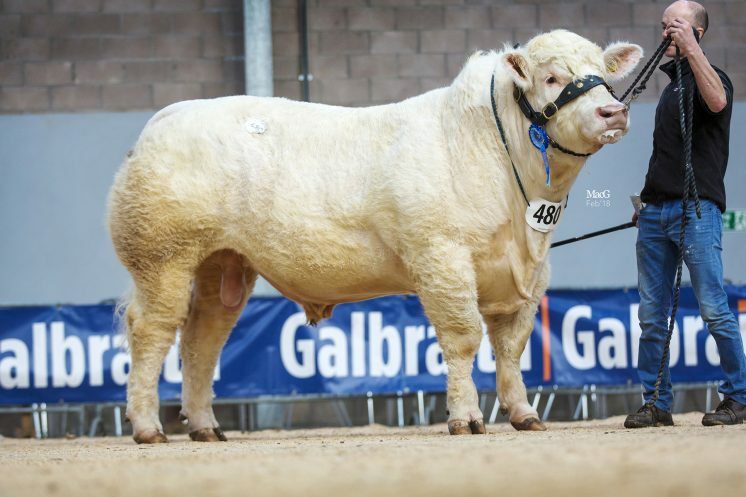 Goldies Marshall, who is sired by the 12,000gns Carlisle reserve senior champion Wesley Equinox, was tapped out first in his class and the 20-month-old is out of Goldies Hippy, a daughter of the proven high performing, short gestation and easy calving Blelack Digger. He goes on the Brechin to work for W Mather and Sons in their Angus holding. Another to bring 10,000gns when chapped down to A and J Wilson, Insch, Aberdeenshire, was Hamish Goldie’s blue ticket winner Goldies Mercedes. 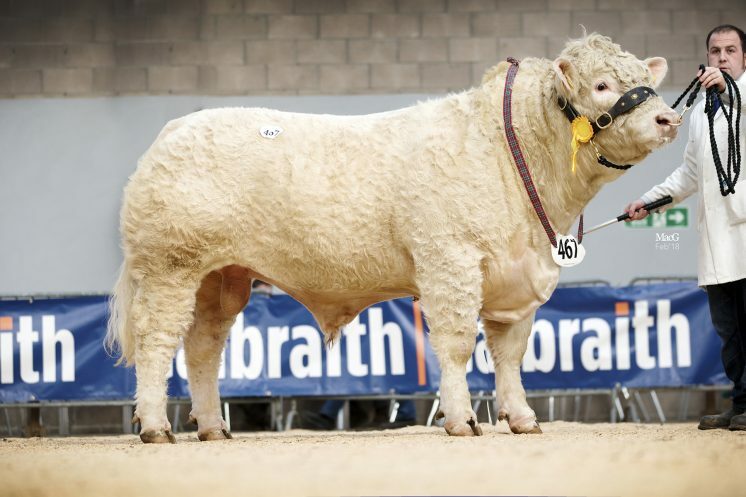 The August 2016-born is by Blelack Blackberet who sired the 2017 Royal Highland Show and Yorkshire Show junior champions. 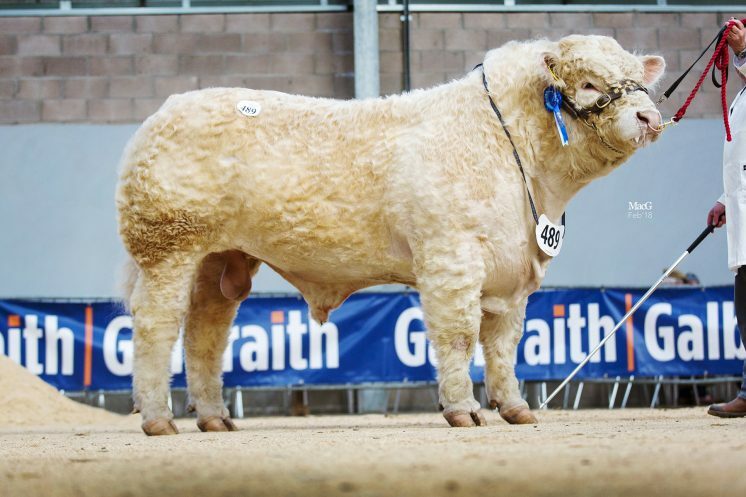 His dam is Goldies Hifi ET who is out of a full sister to the 34,000gns Goldies Uppermost and goes back to the 14,000gns Perth reserve senior champion Goldies Banker. Also Commanding a 10,000gns bid was the Loganbar Interpol-sired Loganbar Magnum. J and W Wilson, Newton Stewart, Wigtownshire, were the winning bidders of this July 2016-born son of the 12,000gns Balmyle Addition daughter Loganbar Ellenour on offer from Murray Lyle, Dunblane, Perthshire. 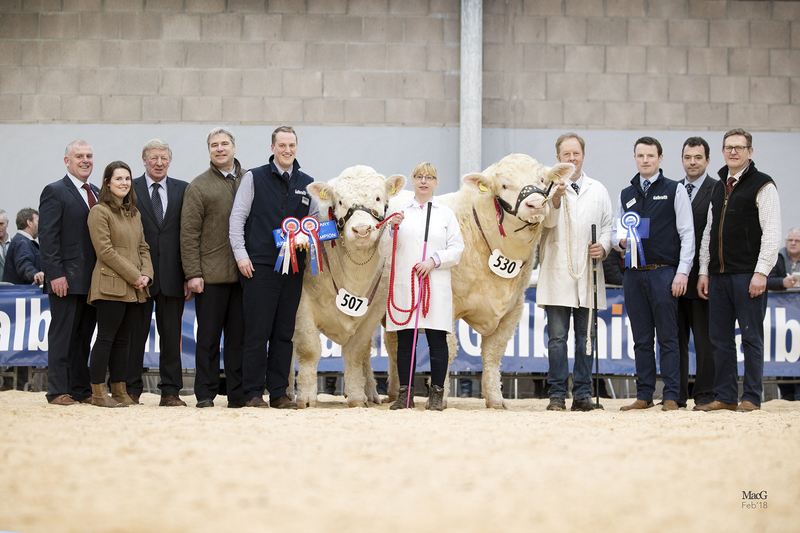 The final lot to make five figures was the 16-month-old, reserve junior champion from consigner Mark McGahan of Glossop, Derbyshire. 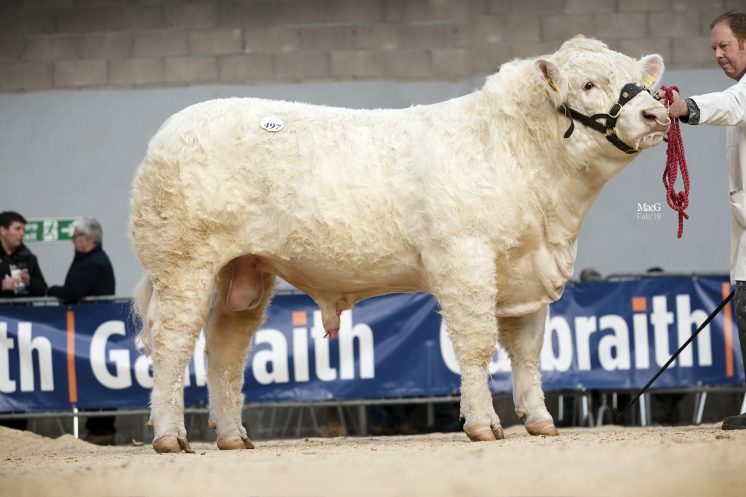 Chunal Maverick who is sired by Harestone Hercules and out of home-bred Chunal Heather who goes back to the 28,000gns Perth supreme champion Brampton Nacodar, was snapped up for 10,000gns by RM Adam and Son, Glamis, Angus. 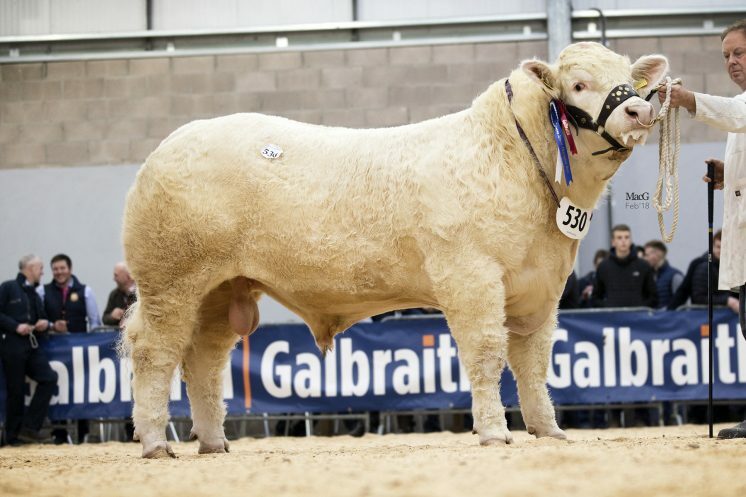 Leading the bids for the small consignment of females at 7,000gns was the June 2016-born Goldies Madame, who had been awarded the female championship at the pre-sale show for breeder and exhibitor Hamish Goldie. Madame who is a daughter of the top performing 15,000gns Gretnahouse Heman and bred out of Goldies Goldengirl, a Goldies Ambassador daughter, caught the eye of K Earle, Penybont, Carmarthenshire. Averages: 115 bulls £7635; 14 heifers £3,684.